As always, we at PDM are over the moon when we hear and receive parties from you guys. Parties that have the prettiest, cutest and over the top themes are our forte but most of you would have noticed, we also have a soft spot for the quirkiest and the “why-didn’t-I-think-of-that” themes. So from the bottom of our hearts, we would like to thank all the parents, event stylists and photographers who rock our email with gorgeous parties one after another. You guys made our 2015 so much fun! One of our goals here in PDM is to help and give you, our dear readers, plenty of inspirations and party ideas to make these once in a lifetime milestones memorable. We sure hope that in our own little way, we managed to reach out to you and helped you in planning your dream celebrations. For our loyal readers and followers, may we request you to put your fist in the screen as we give you this virtual fist bump for being so awesome. You make our time and effort worthwhile when we receive messages of love and appreciation from you guys. Thank you so much! 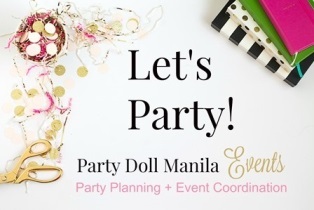 One of our biggest milestones last 2015 is the launching of our very own party online shop – Confetti by PDM. I would like to thank all our customers for the trust and support. I’m working double time to bring in new items this 2016! I’ll give new updates (hopefully very soon) once everything is final so let’s keep our fingers crossed. Also, to my business partners and soon to be business partners, I’m praying for a fruitful 2016 for all of us. We’re wishing everyone a Happy New Year! We hope 2016 will give you more reasons to celebrate life to the fullest and more milestones for you and your family to reach and achieve. I would like to give a special shout-out to Jed Uy Photography for our wonderful family portrait and to my dearest friend Christine Lam Designs for Ashlee and Amber’s beautiful gowns.